On a recent trip to Sylhet, I witnessed an interaction. Our rickshaw puller, an approximate sexagenarian howled an almost joyous “Salam bahey’, while pulling us around, addressing another sexagenarian walking across the street. As a city folk, I was moved by this innocuous yet incredibly human exchange. If we take away the initial romanticism and pick this interaction apart, we could probably see if and how a part of this is shaped by urban planning, or in this case, a blissful lack of birds-eye-view,car-centric, ‘grids and efficiency’ genre of planning. The suburban Sylhet was not well-equipped with public transport, but it had much fewer cars and more pedal-powered transportation. Thanks to the lack of cars, the overall pace was slow enough to accommodate an interaction like this. Since the streets were not yet designed to fit in cars, the street width was human enough to physically enable such interaction. The same scene would not have been possible on a five-lane-highway-with-whooshing-cars. The two gentlemen seemed to have belonged to different economic reality, judging from their clothing. Yet, unlike the metropolitan, this difference had little bearing on the interaction. Presumably, those gentlemen socialize within a neutral, public space. There is a fair chance of that space being a mosque considering the fact that the modern day urban planning rarely leaves room for public gathering spaces. However, these community spaces do not even have to be designated ones as long as the streets accommodate the leisurely pace. On my ride, I observed life happening on that sliver of street. There were ‘taungs’ (roadside tea stall) complete with humble benches, engaging pedestrians and tea-drinkers alike. There were sporadic street hawkers or ‘pheriwalas’ serving the neighborhood with daily necessities, while adding much needed variety of vistas for the onlookers. I have even noted games of carom or chess taking place roadside. These variegated landscape further lured the pedestrians and enlivened the scene for everybody involved. 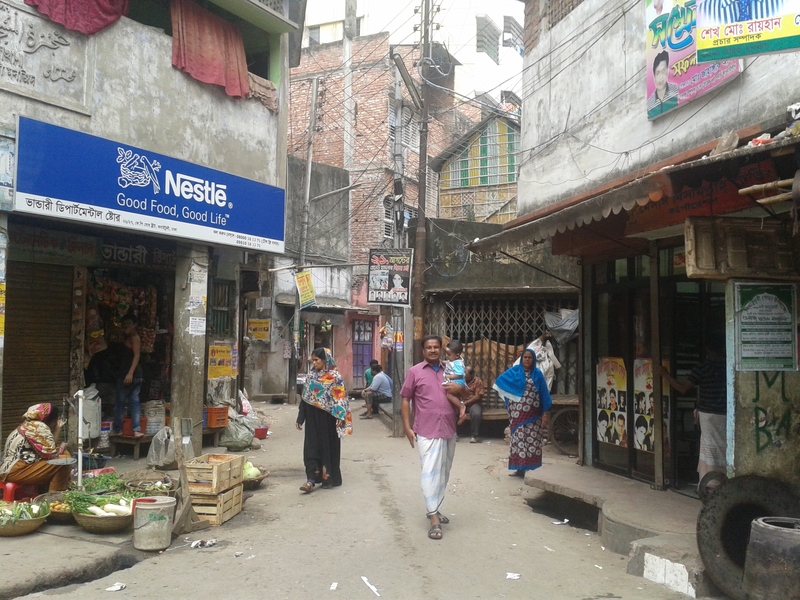 Image above: A father in puran Dhaka enjoying a mid-day stroll with his tot. Can we even imagine this bliss in the wannabe-North-America-new-Dhaka, even if we are awarded some free time? The same factors make puran Dhaka an epitome of vibrancy. The walkable streets, with a variety of street-level shops that invite the pedestrians to haggle, linger, crack jokes or simply stroll. A poster child of the “mixed-use neighborhood” concept that house residences on the upper floors. A neighborhood that offers almost all the necessary services within walking, biking or rickshaa-ing distance. A mélange of stores and activities that keep the streets alive throughout the day; a by-product of which is collective surveillance that naturally curb criminal activity. Not to mention the strong sense of ownership and community that defines this part of the capital. Here’s a truth from which we, the urban folks, have been carefully swayed away, by the petro-planners: people gravitate towards people; even if not for engaging directly in the form of conversation, but in the indirect forms such as observation or eavesdropping. This is why ‘people watching’ is such a popular leisure activity. Wonder if and why we, the cooped up city folks with private parking spaces, are increasingly unhappier and miserable, despite supposedly having it all? The answer might send us back to the drawing board, of urban development. I recently found your blog and am really enjoying reading about minimalism and sustainability from the perspective of someone who didn’t grow up in the U.S. This post made me think of an old essay from Jane Jacobs called “The Use of Sidewalks.” I’m sure you know about her, but it’s interesting to see her ideas on “people drawing people” and safety in collectivism borne out across the world. Thanks for writing! Thank you so much for taking the time to write! It’s so interesting that what comes out of an organic process is usually the best anyway. Jane Jacobs- Robert Moses story taught the same!